Touch, kiss, feed & dance with dolphins. Enjoy the footpush.The Dolphin Swim Program offers the unique opportunity for playful, educational interaction with these wonderful animals in our natural ocean lagoon. Begin with a fun, interactive orientation covering the dolphin’s natural history, training techniques and ocean conservation. Once in your lifejacket, experience the joy of a dolphin kiss and fall in love with their gentleness as you hug a dolphin in your arms. Dance and sing with them, then marvel at the dolphin’s strength as you are propelled across the lagoon in a thrilling footpush! In this program, trainers focus on allowing everyone to enjoy a high degree of interaction with the dolphins, and at the same time, teach you about these amazing animals in their natural habitat. Interact with dolphins from a waist-deep platform brings you closer to an Atlantic Bottlenose dolphin than you ever dreamed possible! Your program begins with a fun, interactive orientation, briefly covering the natural history of dolphins, animal training techniques and ocean conservation. On the Dolphin Encounter float, you will stand on a waist-deep submerged platform and experience a heart-warming kiss, a hug, a dance and opportunities to rub down the dolphin. Your dolphin trainer will combine elements of hands-on contact, education, fun, laughter and adventure to make this an unforgettable experience. For the first time in The Bahamas, Dolphin Encounters is pleased to offer a thrilling Encounter with California Sea Lions. Thrilling Encounter with California Sea Lions. more highly successful and award-winning dolphin interaction programs, our new educational and entertaining Sea Lion Encounter is your chance to experience sea lions live and close-up like never before in our pristine all-natural marine habitat. You will kiss, hug, feed and play with these affectionate and humorous marine mammals. Your sea lion interaction will take place from specially designed, waist-deep water platforms immersed in our calm, private island lagoon. One of the few programs of this kind in the world, it will be a unique adventure you will never forge. View the programs from the dock & take photos/videos. 25.00 Per person professional photo & video staff will be capturing your extraordinary interaction with our animals so you can take home memorable souvenirs of your once-in-a-lifetime experience. Look no further than Dolphin Encounters and Blue Lagoon Island to celebrate your birthday, have your wedding or anniversary, enjoy a corporate event, theme party, or host a team building excursion. 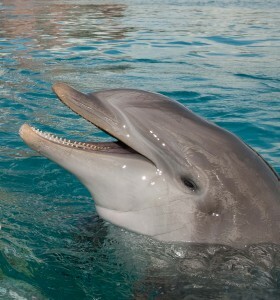 Dolphin Encounters will work with you to create and personalize any special event. program begins with a fun, interactive orientation, briefly covering the natural history of dolphins, animal training techniques and ocean conservation. On the Dolphin Encounter float, you will stand on a waist-deep submerged platform and experience a heart-warming kiss, a hug, a dance and opportunities to rub down the dolphin. Your dolphin trainer will combine elements of hands-on contact, education, fun, laughter and adventure to make this an unforgettable experience. ward winning dolphin interaction programs, our new educational and entertaining Sea Lion Encounterr is your chance to experience sea lions live and close-up like never before in our pristine all-natural marine habitat. You will kiss, hug, feed and play with these affectionate and humorous marine mammals. Your sea lion interaction will take place from specially designed, waist-deep water platforms immersed in our calm, private island lagoon. One of the few programs of this kind in the world, it will be a unique adventure you will never forget!